Masip, J. 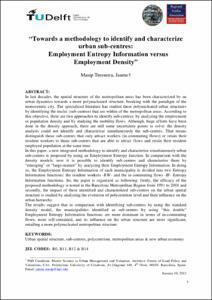 Towards a methodology to identify and characterize urban sub-centres: employment entropy information versus density employment. A: Regional Studies Association Annual European Conference. "Networked regions and cities in times of fragmentation: Developing smart, sustainable and inclusive places. Annual European Conference". Delft: 2012, p. 1-38.